Mark Johnson, winemaker at Chateau Chantal on the Old Mission Peninsula, passed away on August 24, 2017 at the age of 65. The community is feeling the loss of this lovely soul in many ways. I first met Mark years ago when he and his family attended my church, Old Mission Peninsula United Methodist Church, then known as Ogdensburg Methodist Church. As a youngster, I always sat in the back row (as Methodists are prone to do), and Mark and his wife Ursula and their kids sat a few rows ahead of me. Mark was always a bright ray of light – smiling, joking and shaking hands with everyone in his periphery. I lost touch with Mark when I went away for college, and didn’t really see much of him until a couple of years ago, when my daughter started working at Chateau Chantal. When I stopped by to see her at the Chateau, there would be Mark, still smiling, still joking with staff and customers, still shaking hands. My daughter said everyone at the Chateau loved him – and of course it’s easy to see why. Some people just exude this positive spirit, and Mark is one of those people. You knew that if you talked with him or even just said hi, you would leave with a smile on your face. He just made you feel good about life, and that sort of interaction carries over to everyone else you might meet on that particular day. Mark will be greatly missed, and our hearts go out to Ursula and his family, as well as his Chateau Chantal family. In memory of Mark, smile at the folks you see today. Share a joke or a good word. Bring happiness to someone. Pass it on. A Celebration of Life will be held on Sept. 8 at 5:30 p.m. at Sunset Park, located between the Holiday Inn and Hagerty Center on East Front Street in Traverse City, followed by a sunset reception at Chateau Chantal at 7 p.m. Read his full obituary posted at Reynolds-Jonkhoff, below the video. Here is a video of Mark sharing the traditions and history of the Blessing of the Blossoms at this year’s event, held on May 14, 2017. Mark Brian Johnson, 65, of Traverse City passed away Thursday, August 24, 2017. Mark was born in Petoskey and grew up in Mancelona, the youngest child of Fred and Elizabeth (Trall) Johnson. In high school, he met the love of his life, a German foreign exchange student named Ursula. They attended Michigan State University where they both studied social work. The two moved to Germany and after a few years as an overworked and underpaid social worker, Mark knew something had to change. He was drinking cheap wine at the time and it was still costing half of his meager pay. He knew he needed to figure out a way to drink better wine and not have it eat so heavily into his pockets. He decided to begin an apprenticeship as a wine maker and earned an engineering degree in enology in Geisenheim, Germany. In 1975, he was married to Ursula. In 1982, the couple welcomed their daughter, Johanna. Two sons followed, Lars in 1984 and Mattias in 1986. Mark relocated to Traverse City in 1983. 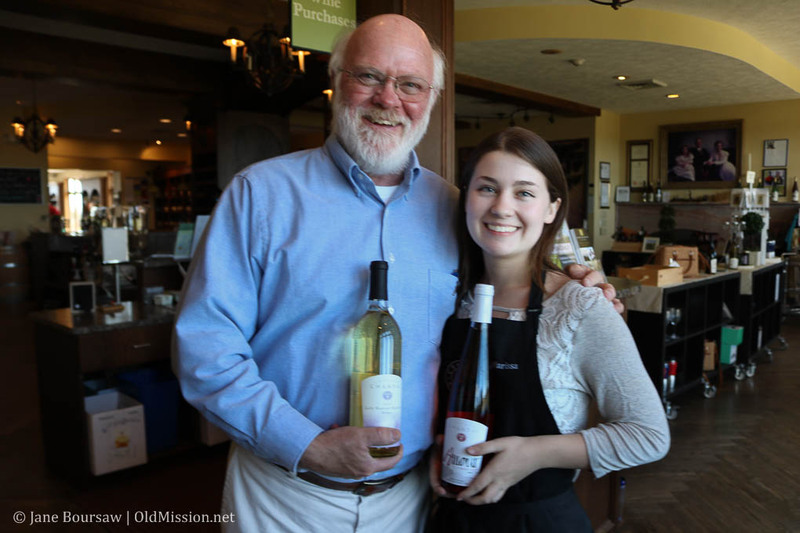 He planted the second vineyard on Old Mission Peninsula. He worked as a winemaker at Chateau Grand Traverse early in his career before his move to Chateau Chantal in 1993, where he worked tirelessly to build something special. 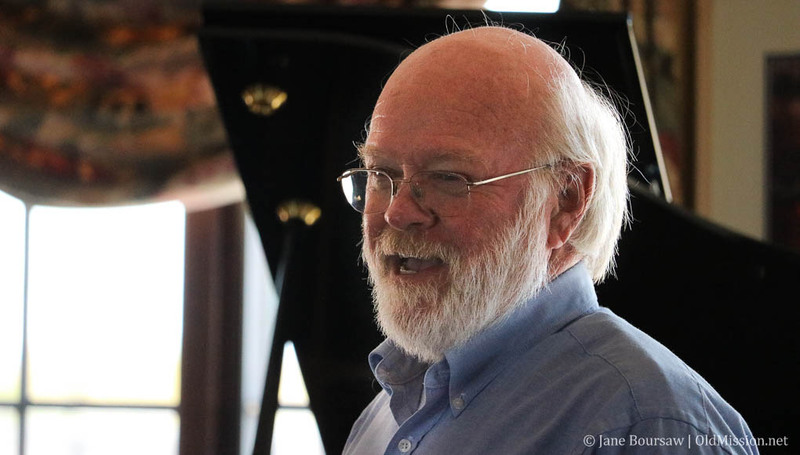 He poured himself into promoting Michigan wines and it was abundantly clear that he was one of the lucky ones who was doing what he loved. Mark was a witty guy, comfortable at the center of any party. He told outrageous stories, some were even true. He was master of the pun. He knew most Dr. Seuss books by heart, and lately a number of toddler books to entertain the two little people he loved more than life itself. And he loved life. He loved floating on the bay with a glass of wine, with a good book or in fellowship with his many friends. He loved his green little babies in the vineyard and all that was connected with the wine business. Loved the happiness shared with colleagues and customers. He left his “Mark” on us all. He is survived by his wife and partner, Ursula; his children Johanna (Gustavo) Lascano, Lars Johnson (Nataliya Baytalskaya), Mattias (Lisa) Johnson; his grandchildren Lia Lascano and Ezra Johnson; his siblings Janet Severance and Terry Johnson; and many other family members and friends. A Celebration of Life will be held on Friday, September 8th at 5:30pm at Sunset Park followed by a sunset reception at Chateau Chantal at 7:00pm. In lieu of sending flowers, the family would prefer donations to Safe Harbor of Grand Traverse (www.gtsafeharbor.org) or Justice For Our Neighbors – West Michigan (www.jfonwestmichigan.org) facilitated by Central United Methodist Church. A well-spoken obituary warming the heart, thank you.